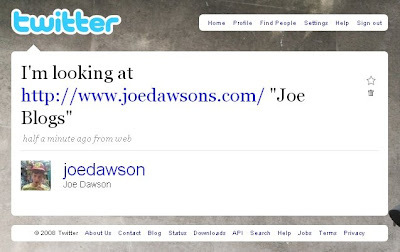 Joe Blogs: @Twitter @GoogleFriendConnect Hey Guys! 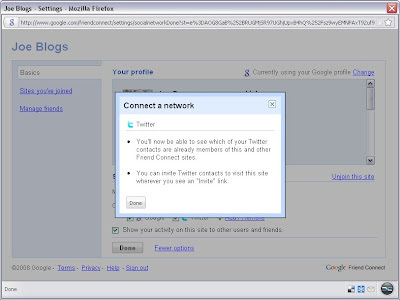 Image via CrunchBase, source unknownGoogle have today announced that Google Friend Connect has integrated with Twitter. This means that when you join a friend connected site, you can choose to use your Twitter profile, discover people you follow on Twitter who are also members of the site, and quickly tweet that you have found a cool website. 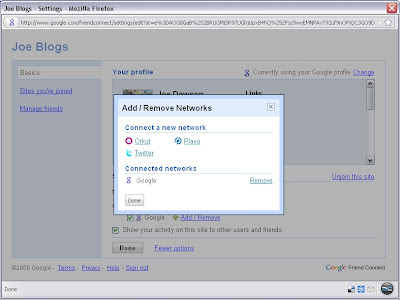 Friend Connect supports logins from Google, Yahoo, AIM, and OpenID, I use my Google Account to login to the service and in the settings you will find the option to Add/Remove Networks. 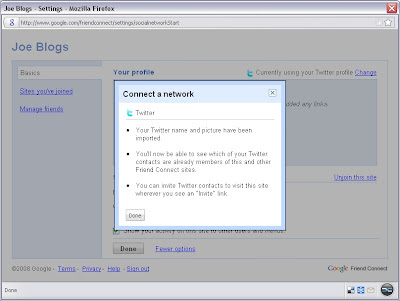 Located in this setting you will be able to connect a new network, as well as Twitter you can also use Orkut or Plaxo. 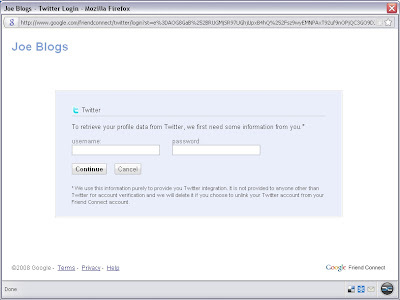 Press continue and you will be taken to a login screen where you will be asked to provide your Twitter username and password. 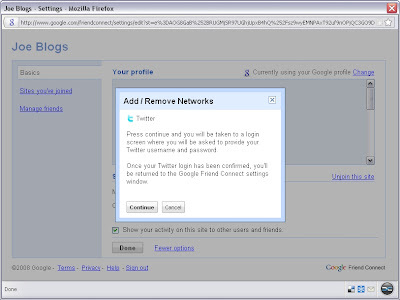 Once your Twitter login has been confirmed, you'll be returned to the Google Friend Connect settings window. You'll now be able to see which of your Twitter contacts are already members of this and other Friend Connect sites. You can invite Twitter contacts to visit this site wherever you see an "Invite" link. The integration is definitely a positive for Friend Connect, it's also a strong statement from Twitter having overcome reliability problems earlier this year. Twitter has become the first third party service after Plaxo to integrate with Google’s new service and there is potential to expand on the features available. 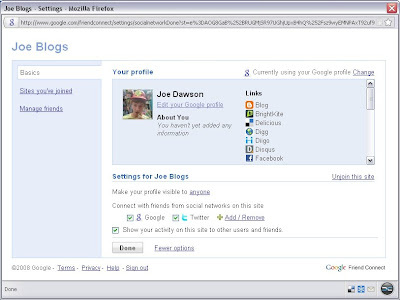 I would like to see the ability to share individual blog posts as that would be a feature I would use daily!